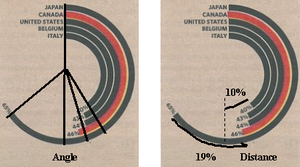 I agree that the racetrack is misleading, but the difference between Canada and Japan is actually 19%, so it isn't quite as bad as it looks. Eyeballing the Italy to vertical gap which is 10%, it looks like the difference between Canada and Japan is closer to 30%, which is still a lot more than 19%. Is there a way to contribute a bit to the cause of the Christmas wishlist? I would be happy to kick in $5, but a whole book is a lot. AM - I'll look into it. Thanks for offering.